When Curly was six months old, we moved to a bigger house. I was hesitant to move initially, because the new house was not included on the school's free bus route. It was, however, less expensive to move then to put on an addition. A woman named Mary Ann, who I had known for years, lived directly across the street from our new house. Her kids attended the same Catholic School as our kids. Not long after we were settled, I called Mary Ann and asked her if she would be willing to drive Eddie home for me the following day. Laddie needed to stay after school for altar server practice, and if she could just grab Eddie for me then Curly could finish her nap before I had drive back to school to get Laddie. She agreed to drive him, but she asked me to instruct Eddie to look for her car in front of the rectory after school. Her kids walked to her car in the parking lot at dismissal. She didn't exit her vehicle, and clearly this occasion would not warrant an adjustment to her plan. 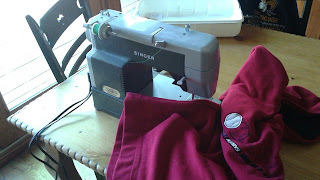 The next afternoon I sat down in front of my sewing machine at the kitchen table. I was sewing the pocket of a hoodie sweatshirt that belonged toMary Ann’s teenage son, Rick. She had approached me a few days before and asked me to sew it for him. Apparently this was the only ‘coat’ she could get Rick to wear, and my Laddie had ripped the pocket in a game of backyard football. (After Mary Ann had marched back across the street to her house, Laddie pointed out to dumbfounded-me that Rick's brother Ryan had told him not to worry about it. The pocket had been previously ripped. Laddie had caused additional damage to it during their game, but it was an accident. They were playing football after all, not chess). Mary Ann explained that since she knew that I sewed, she decided she would ask me to fix it rather than take it to a tailor, but if I would prefer she go the tailor route I could let her know. My muddled head screamed ‘tailor, tailor!‘, but dumbfounded-me couldn’t spit out the words. Welcome to the neighborhood. Curly was a fussy baby. Her ability to cling to me resembled the baby monkey instincts we witnessed so often at the zoo. I rarely put her down. She required a barium enema when she was six months old. That fall I had constructed easy Halloween costumes that required little or no hand sewing. I refused to unpack the sewing machine. No cutting out patterns. No multiple trips to the fabric store. But for Mary Ann’s request, I dug through my closet until I came to the unopened sewing machine box. I lugged it down to the kitchen table and prepared to secure the torn pocket. The phone rang. It was Mary Ann. She was shouting into the phone. I instinctively jumped from the chair and ran to get my car keys. She couldn’t find Eddie. Did I remember to tell him where she parked her car? Did he forget she was picking him up? A question I struggled to answer definitively as mind reading is not my foray. Ironically I was working on fixing Mary Ann's kid's sweatshirt when she called me freaking out that Eddie didn't walk to her car the day I asked her to drive him home from school. Eddie was in 2nd grade. I guessed that he had forgotten the ride arrangement, and my detailed instructions. He was probably waiting for me near the flag pole. Her 8th grader, whose sweatshirt I was sewing, sat in the front seat next to her. She had no plans to get out of her car. Finally, she agreed to send Rick to find Eddie. She then pointed out how important it was for her kids to get home because they had basketball tryouts that night. They needed to get started on their homework. I could see how this five minute fiasco could put a real damper on study time. When her rant was complete, I hung up. Waited for my pulse to slow down. I looked at my unwelcome sewing project and was tempted to sew the arms hole openings shut.